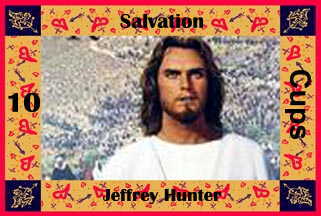 Jeffrey as Jesus Christ. Embodying salvation is a pretty huge responsibility for a person. Jeffrey Hunter was in some important movies in the '50s and '60s (including "Hell to Eternity" and "The Searchers"), but he is most famous today for two of his later roles, both of which embodied Salvation: Jesus Christ (King of Kings), and Christopher Pike (Captain of the U.S.S. Enterprise in the Star Trek pilot movie). It would be hard to avoid type-casting after that. The King of Kings was saved from King of Kings for sale.